Address: 1 Ratchadamnoennok Rd, Boryang Sub-district, Muang District, Songkhla 90000, Thailand. Rajamangal University of Technology Srivijaya Songkhla Campus (RMUTSV) is a new group university located in the south of Thailand. With the National Education Act, B.E. 2542 (1999) aimed to decentralize management in education institutes to make them more independent and flexible to handle their own affairs under the university council, Rajamangala Institute of Technology subsequently amended the law governing the institution at that time before enacting it as the “Rajamangala University of Technology Act,” which HM the King signed on 8 January 2005.The law, announced in the Royal Gazette ten days later before coming into effect on 19 January 2005, combines all campuses nationwide into nine Rajamangala University of Technology ; namely, RMUT Thanyaburi, RMUT Krungthep, RMUT Tawan-ok, RMUT Phra Nakhon, RMUT Rattanakosin, RMUT Lanna, RMUT Srivijaya, RMUT Suvarnabhumi and RMUT Isarn. The intention is to turn these nine universities into science and technology university offering advanced vocational training in undergraduate, graduate and Ph.D. levels to accommodate vocational students and to provide education opportunities to those graduated from community colleges. The integration is aimed to provide an opportunity for students to continue vocational study at the undergraduate level. All nine RMUT have been under the supervision of the Office of Commission on Higher Education (OCHE), Ministry of Education. 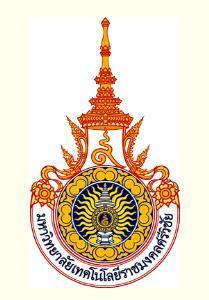 With regard to RMUT Srivijaya or RMUTSV in short, the university is composed of three provincial areas including five campuses namely, Songklha Campus, Nakhonsithammarat (Thung Yai) Campus Nakhonsithammarat (Sai Yai) Campus, Nakhonsithammarat (Khanom Campus, and Trang Campus, respectively. RMUTSV offers education at the graduate level in ten faculties and three College like Agriculture, Agro-industry, Architecture, Business Administration, Engineering, Liberal Arts, Management Technology Science and Technology, Science and Fisheries and Technology, and Veterinary Medicine and College of Hospitality and Tourism, College of Industrial Technology and Management and Rattaphum College At present, RMUTSV has more than 15,000 students. There are about 4,000-5,000 enrollment students each year. RMUTSV will become a professional in the development of scientific and technological education for graduates with full of competence and high ethics. To create research activities, inventions and innovations on science and technology which can be transferred into value–added goods and services for the country. To provide academic service and creative education with a purpose to prepare graduates for independent careers to stay competitive in their profession.